I tried the second-generation mesh WiFi system from Eero, a startup that Amazon recently bought. Eero’s second-generation mesh WiFi system delivered stronger WiFi signals and speed than a traditional WiFi router and extender setup usually does. At the same time, major networking companies had also released their own mesh systems when Eero released its second generation of mesh routers that compare with Eero’s performance, and they make Eero’s prices seem high. Back in 2016, I tried the original Eero mesh WiFi system. It delivered fast and strong WiFi throughout my home, even in places that were considered WiFi dead-zones. The Eero devices also proved to be much easier to set up than the traditional WiFi extenders, and they delivered much faster speeds, too. Then, in 2017, Eero came out with new devices that do everything the original models did, but better. The company says the new routers have twice the power and range as the original systems, and there are new satellite devices, called Beacon, that are easier to install around your home. I tested the second-generation Eero and Beacon shortly after they were released, before Amazon acquired the company. Eero’s latest second-generation mesh routers look better than most standard WiFi routers, which have less-inspired designs and antennas sticking out. 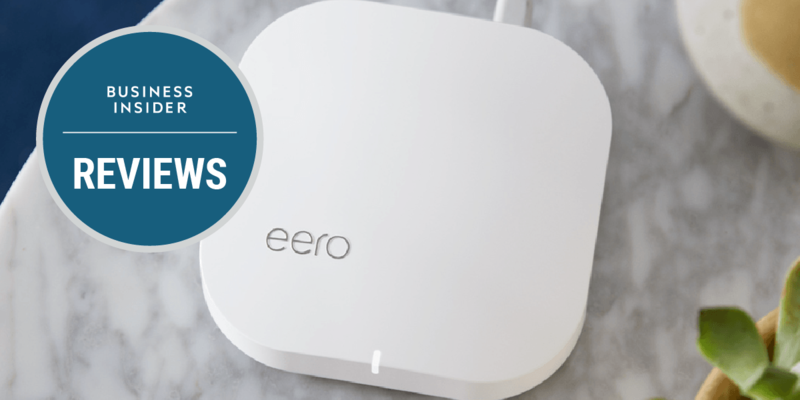 Eero also says the new routers have twice the power and range as the first-generation Eeros. I tried the option for „most homes,“ as described by Eero itself, which includes a primary Eero router and two new, smaller Eero Beacons that plug directly into your power outlets without a cord. Eero says the „most homes“ option should cover homes with two to four bedrooms, which is a little vague, as it doesn’t tell you the square footage of its range. But it’s still a decent indicator for which option is best for you. The new Beacon satellite units are half the size of the regular Eero router, and they’re 20% to 30% more powerful than the original Eero routers. Their direct plug-in design is great for places where you may not want a power cord, like a hallway, stairwell, or power outlets above a kitchen counter. That’s a thoughtful design choice, as it gives you more options to place an Eero satellite unit. I placed the main Eero router in the living room in the middle of my house, a Beacon around the laundry room where a guest is staying in the guest room, and another Beacon upstairs in the master bedroom. You set up the Eero using its app on your mobile device. Both the Eero units and your smartphone communicate with each other via Bluetooth. Before doing anything, use your old WiFi connection to download the app. Then, follow the steps in the app to set up a new Eero WiFi network.